Finland is the most densely forested country in Europe. Covering over 80 % of the land area the forest holds a prominent position in Finnish culture, heritage and history. Forests are even referred to as the “green gold” of Finland showing their tremendous importance to the nation. For Finns the forest has from the beginning of time been a place to seek safety, food, building material, sanctuary and solace anda connection to something greater. For Icelanders the forest on the other hand is an exotic nature element lacking from the nation’s terrain. 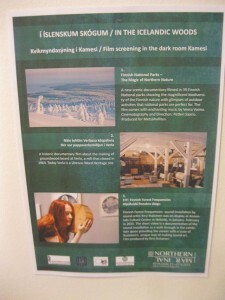 The aim of the In the Icelandic Woods- exhibition is therefore to figuratively plant a forest landscape on Iceland, which in contrast to Finland is known as the country of fire and ice. As a whole the exhibition will showcase the multiple meanings the forest holds in Finnish culture with the help of art, design and general information about forestry, its industrial heritage and dynamic presence with cutting- edge innovations. The exhibition will be divided into four main themes: Finnish masters inspired by nature, Forest and Well-being, Forest and Tourism and Forest and Industrial heritage. Visitors are invited to absorb the spirits of the forest through different medias such as film, photography, art, sound, literature, food as well as physical items connected to forest culture. Workshops and forest fun for children and adults in connection to the exhibition will also be available. 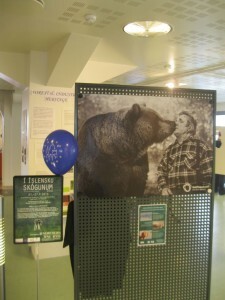 The exhibition includes a presentation of forest related works and stories from famous classic artists’ lives such as those of writer Aleksis Kivi, composer Jean Sibelius and painters Pekka Halonen and Akseli Gallen-Kallela, of whom the last three celebrate their 150th birthday in 2015. In addition to the art world of classic masters, In the Icelandic Woods-exhibition will also showcase how contemporary Finnish artists have captured the essence of the forest in their works, e.g. Saana & Olli Design Company in textiles, artist Saara Kiuru in her art work, artist Tiina Tanskanen in her photography, acclaimed graphic designer Erik Bruun in his poster art work and internationally renowned Finnish nature photographer Hannu Hautala in his nature books and documentaries. The exhibition is part of the week long culture festival Northern Marginal – Culture export with attitude! which is created and produced by the Northern Marginal Association along with students from Humak University of Applied Sciences, majoring in Culture production and Event management. 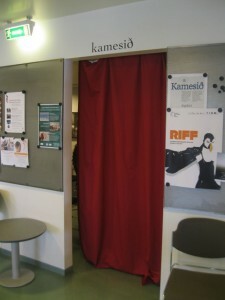 The project has been funded by The Icelandic- Finnish Cultural Foundation and The Finnish Music Foundation. The exhibition will feature materials aquired from, among others, Visit Finland, several museums including Forest Museum Lusto, Museum Halosenniemi, Gallen-Kallela Museum, nature centers and destinations, Hannu Hautala Foundation, Finnish Literature Society, companies and associations providing facts and information about the forest such as Luke Nature Resources Institute Finland, Pro Puu Association (guild of wood professionals) and The Finnish Society of Industrial Heritage.